Jeremiah 6:16, Thus saith the LORD, Stand ye in the ways, and see, and ask for the old paths, where is the good way, and walk therein, and ye shall find rest for your souls. But they said, We will not walk therein. In these wicked times we all need much Bible-preaching from fundamentalist preachers. Oh how Christians today need to hear preaching. Titus 1:3 says, “But hath in due times manifested his word through preaching, which is committed unto me according to the commandment of God our Saviour.” God manifests His Word THROUGH PREACHING!!! Forget all the ecumenical books in today's liberal Christian books stores! You'll learn 10 times more about God's Word by listening to lots of Bible-preaching, then you will be reading Max Lucado's wishy-washy Church Of Christ books. And so here are some needful thoughts which I gleaned from Pastor Owen's sermon. Max Lucado teaches Baptismal Regeneration. There are many Scriptures in the Bible that teach us to separate from wrong religious people and ministries. This is called “Ecclesiastical Separation,” and there are many Bible verses which teach it. The word “tradition” here means “that which has been entrusted to you by someone previously.” The word tradition here is the Greek paradosis and means “transmission,” that is, (concretely) a precept. This refers to the doctrines of the Word of God, transmitted from one generation to the next. The word “disorderly” is the Greek word atakteo and means “to be (that is, act) irregular,” that is, out of order. Hence, we are commanded to withdraw from religious people who walk out of order doctrinally, not transmitting the teachings of the Bible. This realistically excludes over 95% of all religious people today. When we stand against religious liberalism and error, we don't do it to be mean. We do it so we might follow the Biblical example of the Apostle Paul who said, 2nd Timothy 4:7, “I have fought a good fight, I have finished my course, I have kept the faith.” The term new fundamentalism is a misnomer, for there is no such thing as new fundamentalism. It's either the old-time way or it's not fundamentalism. A “fundamentalist” is someone who takes the Bible at face value and believes that every Word of the Bible is inspired, and that includes the King James Bible. Old-fashioned, fighting, fundamentalists and fighting preachers are suddenly being replaced with pampered preaching, thumb-sucking babies and pacifists. There's a movement away from our roots in fundamentalism. There's a modern-day exodus out of the Promised Land of the old-time religion into the the Wilderness of apostasy. Choose the old-paths!!! We are taught by God that ALL Scriptures are given by inspiration, which means they are inspired and remain inspired to each generation. God never promised to inspire a language; but rather, He promised to inspire His Words. God's Words are still inspired no matter what language they are translated into. The King James Bible is INSPIRED 100%!!! It would be impossible to obey Matthew 4:4 (quoted from Deuteronomy 8:3) if we didn't have an every Word Bible. Shame on any preacher who says that we don't have a perfect Bible. 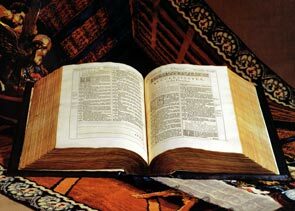 Bless God the Words of the King James Bible are the preserved, inerrant and inspired Words of God for the World today. English is the universal language today. God knew what He was doing. The King James Bible is the last Bible we will ever see before the Lord returns. 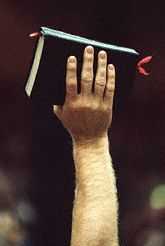 Chalk it down, when a church tampers with the Bible they're headed for destruction spiritually!!! The preachers who are the most on-fire for God, guaranteed, are the ones who still believe that the King James Bible is INSPIRED! I wouldn't spend 10 seconds in a church where the pastor denies the inspiration of the King James Bible!!! The so called new fundamentalism has a problem with an inspired and perfect English Bible. You can still stand for the truth and love people. The new fundamentalism, so called, wants to be accepted by everybody, so they also accept a bunch of doctrinal error to pull people together. The neo-evangelicals do the same thing. It is sinful compromise. Doctrine causes tension, which is why apostate preachers today are cowering away from preaching the truth! Our churches are plagued today with works salvation. The curse of Lordship Salvation has crept into most of our so called evangelical churches. The Devil has blinded many churchgoers to adopt the same heresy as the Jehovah Witnesses concerning salvation, who add human effort to faith in Christ. In an attempt to be accepted by others, they dip their sails in sinful compromise. God deliver us from new-evangelical churches. The truth is most important in a genuine New Testament Church. Entertainment doesn't win people to the Lord. Most churches today are bringing in entertainment because most people won't attend church just to hear Bible-preaching. The speaking-in-tongues mess is popular in churches today, and it's of the Devil. The Bible never teaches the Jibber-jabber type of speaking in unknown tongues that exists in apostate churches today. Biblical tongues were ALWAYS initiated by God (not men as with Charismatic tongues); and Biblical tongues were ALWAYS a known, earthly, established, language. At Pentecost in Acts 2 Peter didn't speak in multiple languages. Peter preached in his native tongue and every man heard in his own tongue. So in actuality they heard in tongues. No one was acting the fool like Benny Hinn saying yaba-daba-doo do and scooby-dooby-do do. The doctrine of Socialism is destroying our country. Big government and welfare social programs all lead eventually to Communism (total government control of everything). Communism has ruined every society it has ever impacted, destroying capitalism by rewarding laziness and punishing those who work hard to succeed. Karl Marx summed up Communism with one statement, that is, abolition of private property. You see, with land ownership comes property rights. No property means no rights. If the government owns all the land, then the citizens have no say in anything. All a criminal government has to do to steal people's property is keep raising taxes. Taxation is easily made a weapon! The meaning of what it means to be born-again has been redefined to mean giving your life to Jesus, which is what Roman Catholics teach. The meaning of repentance unto salvation has been redefined to mean a change of life instead of a change of mind which the Bible teaches. Doctrinal error has crept into today's churches and is being tolerated. The preachers who get up and preach doctrine are not liked. Jesus was not liked. Paul was not liked. In fact, something is wrong when everyone likes a preacher. Everyone likes Joel Osteen because he is a psychologist, not a Bible-preacher! In this new so-called fundamentalism we see that Contemporary Christian Music (CCM) is very strong. They have a shallow stand. Anytime that you become shallow in your stand, you become shallow in your music. Music is one of the best thermometers of Christianity known. The weaker that the music gets in churches, the weaker the churches get. Their music has become more about emotion than message. It's almost that Hollywood, airy, sensual music. The old time hymns are no longer good enough. They old hymns don't remind people of the Rock 'N' Roll culture and the night clubs. Entertainment, overhead projection screens and orchestras have replaced hellfire preaching, dirt trails and mourners benches. People murder their children in abortion centers and commit heinous acts of wickedness, and then they mock and desecrate everything that is holy and sacred. As I drove out of the mall I saw a Toyota Jeep for sale with the words above it, “Freedom Comes In Many Shapes And Sizes!” We are living in a materialistic and ungrateful society, where nothing is taken seriously anymore, and everything's a joke and about making money. Freedom is not buying a new vehicle. That's all freedom means to people these days, that is, buying a new vehicle. What ingrates! Some things ought not be joked about. Freedom used to mean something. Being a saint used to mean something. One nation under God used to mean something. I heard some idiot on YouTube this week say that “One Nation Under God” (which was added to our nation's pledge in 1954 during the Communist threat) is a total violation of the U.S. Constitution's prohibition of making a law establishing religion. He's wrong! Separation of Church and State doesn't mean separation of God and State. God is supposed to control government. Today's average church member is woefully ignorant of Biblical doctrine. I say this to the shame of ministers. All the singing of the Hillsong Church won't get anybody saved. They've made a religion out of music, worshipping the performers instead of Jesus Christ. Doctrine is no where to be found. It's almost as if they're embarrassed of the old-time religion. The old-time religion is simply Biblical Christianity. They are changing things today, embracing modern apostasy. We need not apologize for following the old paths. As Christians we ought to cross the line all the time, preaching the truth. The Bible is brutally honest, mashing on the toes of everyone who reads It's Words. God spares no one and takes no prisoners, being brutally direct and honest in His Word. That's why Satan keeps changing the Bible in the Bible-of-the-month club. Homosexuals are continually changing the Bible, just as God said they would in Romans 1:25. Feminism is the rot of society and has crept into our churches. The old-time religion is dead in today's churches. Joyce Meyer needs to go home and bake brownies. The Bible does not teach that women are inferior to men, but women are to help their man (not vise versa). A woman has a place, Biblically, and that place is in the home (1st Timothy 5:14-15). A lady has a place, just as a man has a place. The right kind of church is going to teach women that they ought to be submissive to their husbands. But you won't find many preachers today who will preach this anymore because they are part of a feminist movement, and the pressure of society is causing them not to preach that. Ladies, there's nothing wrong with being a wife and a mama. This rotten feminist society tries to make stay-at-home mothers feel inferior. Praise God for homemakers!!! The women who lead active careers and have children entrust other people or relatives to raise their child. It's unbiblical. No one cares about your child as much as you. And if they do something is wrong with you! A woman who will have an abortion and kill her own baby is capable of unthinkable evils. If she'll murder her own child, do you think she cares about her neighbor or anyone else, truly? How can you love others and hate your own baby? Nothing is more frightening than a woman without God. Solomon said he found the woman to be more bitter than death. And, likewise, nothing is as powerful and uplifting than a virtuous, prudent, woman who honors the Lord. I believe a godly mother is the most deadly weapon against Satan next to the Word of God. The so called new fundamentalist does not want to tell people they have a lack of peace in their life because there's sin. So they sooth their conscience instead of kick the Devil out of them. The so called new fundamentalist does not want to offend, so they back down their preaching. Psalms 119:165, “Great peace have they which love thy law: and nothing shall offend them.” You won't be offended with hard preaching if you're right with God. The so called new fundamentalist takes on a counseling style from the pulpit instead of a preaching style. They aim for psychological wholeness rather than Bible correctness. They help you justify your excuses instead of kicking you in the britches. I don't preach to make people mad, although I make people mad when I preach. I never preach with the intention of getting an enemy, but I never preach afraid of making an enemy. Nobody tells me what to preach, nor how to preach it. Only God tells me what to preach. This new type of preaching is almost mystical, missing handles that you can grab hold of. In today's new fundamentalism you say, “I wonder where they're going,” and you never quite totally get there, and you never can quite figure it out. It's a floaty, half-drugged-up kind of preaching. I like preaching where when you leave you can say, “I think I know what he just said.” People may leave and say, “I don't like him,” but at least you made a decision while you were there. Liberals can't build a popsicle stand, so they steal the work of others and assume it. Some of America's most liberal schools were built by old-time religion people, but were corrupted through the years. They dilute the minds of their students. They tell the students that the country preacher is outdated. They shake the faith of young people in the inspiration of the King James Bible. I'd rather have someone who is unsophisticated who preaches the Bible, than someone who is sophisticated who doesn't know the doctrines of the Bible. If churches aren't careful, they may overstrap themselves financially and then compromise to prevent losing tithing members. This new so-called fundamentalism heads toward preaching and practicing a social gospel. They stop preaching on Hell for fear of offending someone. They're afraid to tell someone that they'll split Hell wide open. They stop having alter calls. They stop thinking that the answer to alcoholism is salvation, and they start promoting social programs. Instead of salvation being the answer to drug-addiction, now they all sit around in a circle and give testimonies, receiving psychological instructions. People have been giving up vices for thousands of years. Nothing has ever turned people around any more than Bible-preaching on salvation. The so called new fundamentalist has left the primary purpose of winning souls and now are trying to alleviate human suffering. Keeping someone out of Hell is the greatest form of alleviating human suffering! Soul-winning ought to be one of our highest priorities in any church. Tree-huggers need to hug the tree of the cross of Calvary and get a real cause worth dying for. The so called new fundamentalists are yoking up with Charismatics, admiring their big crowds. If you're not careful, you'll start doing what the Charismatics do in order to draw a larger crowd. Entertainment has replaced Bible-preaching. If preaching against Hell and adultery diminishes the size of the church, then so be it! The new fundamentalist now criticizes their old position once held. Now they call you a legalist, not even knowing what they term means. Legalism is adding some sort of work to salvation. The so called new fundamentalists have a chip on their shoulder toward the old time religion, because it reveals where they have come from. They now attack what they used to defend. Their moving to the left instead of the right, erring from the faith. The new fundamentalist leaves doing right as an option instead of a commandment from God. The truth produces godliness. The new fundamentalist markets the church like a business, seeking what the community wants in a church. They have no standard. They preach a no guilt style message. They use worldly music. Isaiah 31:1, “Woe to them that go down to Egypt for help; and stay on horses, and trust in chariots, because they are many; and in horsemen, because they are very strong; but they look not unto the Holy One of Israel, neither seek the LORD!” Egypt represents the world. See, they want man-centered sermons instead of God-centered sermons. Entertainment in a church replaces the real ministry. The best atmosphere in the world is the power of the Holy Spirit of God in a New Testament Church. Today they're trying to “create an atmosphere.” That's scary! The only atmosphere we need is the presence and power of the Holy Spirit of God. Today churches want a social club. People want a social club. The church is not a sports club. You show me that in the Bible. God pity this wicked generation. The church is not a talk show, nor a talent show, nor an opera, nor a social center, nor is it a movie theatre. The new fundamentalist is no fundamentalist at all, but is indeed a new-evangelical in denial. Satan always moves the ancient landmark incrementally, undetected by most believers who don't diligently guard against the Devil creeping into our churches. Not everything that says “church” is a church. Not everyone who mentions “Jesus” is right with Jesus. The so called new fundamentalist won't tell you that. Not everyone goes to Heaven who dies. That really offends people when you say that. You can't better the old-time religion. Beware of anything new.